No business is foreign to metrics or key performance indicators. For the recruitment profession, this is integral to avoid month end shock or quarter end nasty surprises. More importantly, it is to provide a line of sight for management in a service industry where delivery is not as predictable as the manufacturing of goods. It is of no wonder that in recruitment, there is also an overflowing list of indicators. Sometimes, it seems we measure everything including the number of times we breathe! While management prowl over these numbers, recruiters drown in them. So how many calls do we have to make? And how many visits? And how many interviews? The list goes on. To be sure, there is great merit in numbers. However, if the meaning of the measurement is lost, then it will only create more confusion and work around. Often, it is also useful to remember that it is the sum of numbers that tell a story. For a recruiter who wants to track their performance, I would propose to start with 3 most important numbers: bill, work in progress and pipeline. The other metrics will help to find areas of improvement. This is the most direct financial measurement of performance. Every recruiter who has completed a placement will bill a client. The split in fees can be complicated but every recruiter knows their bill since their commission is dependent on it. This is often a difficult but necessary gauge. 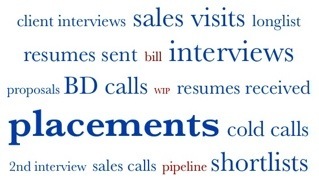 For a recruiter who has responsibilities in sales, this is an important reference point towards bill. The exactness of the number in itself is not as important as its use a ratio to bill and manage activities accordingly. Normally, it is the most straight forward to fix a point where a sales potential is considered a pipeline. Example, it can be the point of price negotiation or when the client asks for a proposal. The pipeline will be the projected recruitment fees. Whether it is bill, work in progress (WIP) or pipeline, it is meaningless to look at 1 number alone if the aim is to manage activities. On a weekly and monthly basis, these numbers together can provide either a form of assurance on month end result or a form of motivation to get more done when considered together as predictable performance. At the beginning of the month, my bill is 0, my WIP is 100k, my pipeline is 150k. At the end of the month, I manage to bill 50k from the WIP and I managed to convert 50k of my sales pipeline into WIP and my pipeline is left with 100k. With these ratios as guidance, the weekly and monthly activities should be governed by the WIP and pipeline to achieved the desire bill. If the WIP is shorter than required or if it is the pipeline, then it can be predicted that bill will suffer. Efforts can be put in to look into adjusting sales activities or delivery activities accordingly. If each recruiter man recount these numbers easily, they are more aware of their performance towards the end of the month. Other activities such as sales calls, visits, interviews are complimentary to understand what works and what more is required. That is for another time. And so is contracting.